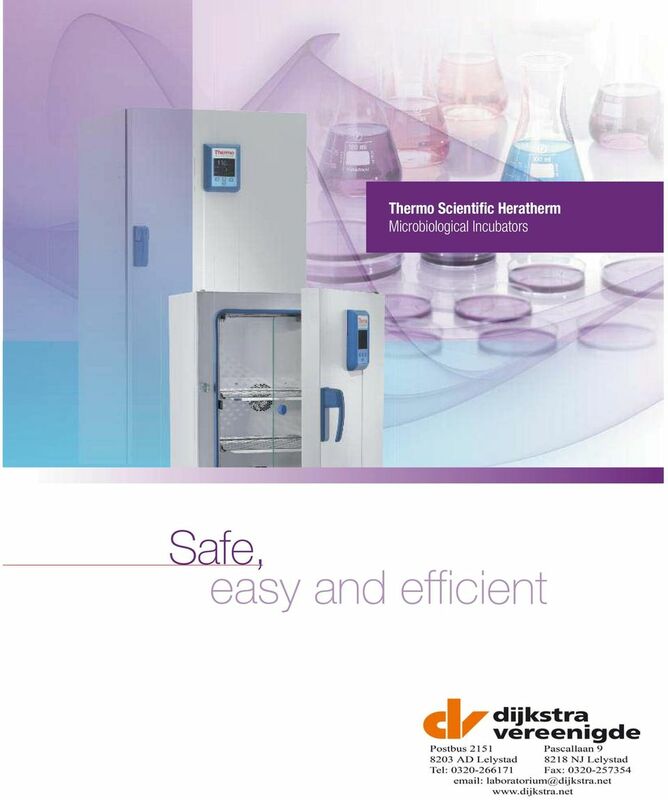 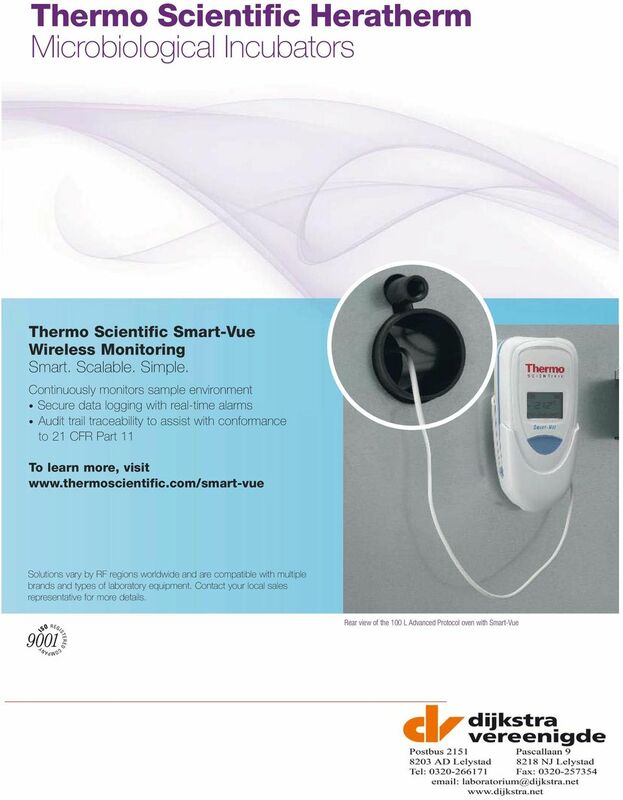 Download "Thermo Scientific Heratherm Microbiological Incubators. 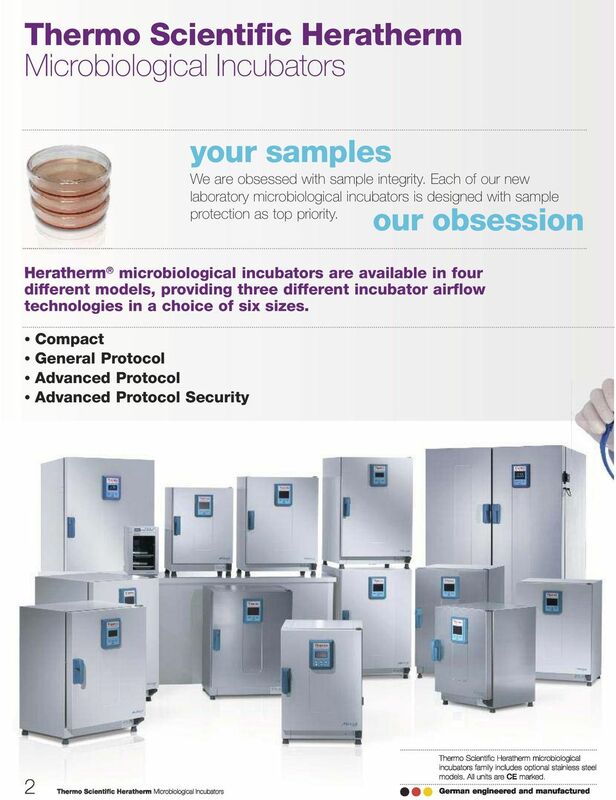 Safe, easy and efficient"
6 Compact Incubator The most compact unit of the Heratherm microbiological incubator family has an 18L capacity, ideal for personalized workspace. 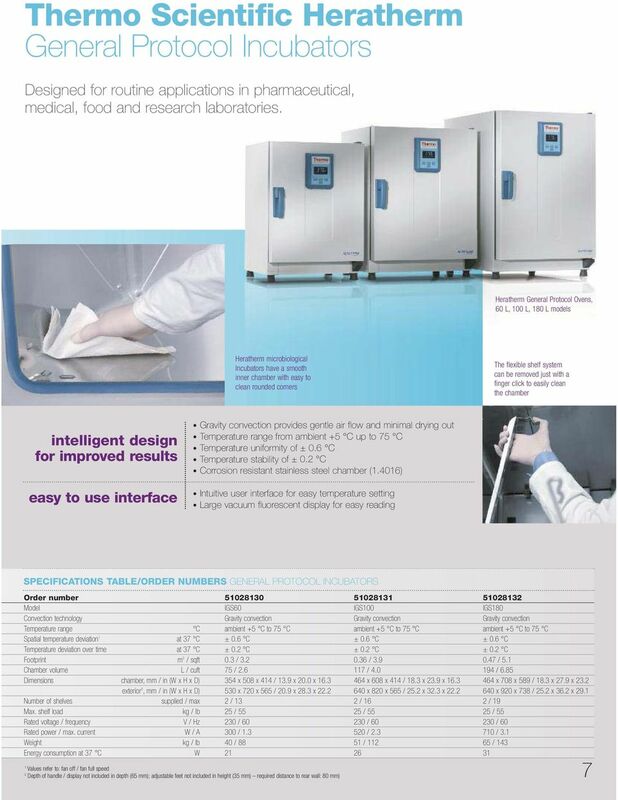 Heratherm Compact microbiological incubator, 18L smart solution for small volume applications Minimal footprint for space restricted lab areas Temperatures at or below ambient High temperature accuracy Internal light facilitates sample observartion Easy to use interface 6 Thermo Scientific Heratherm Microbiological Incubators SPECIFICATIONS TABLE/ORDER NUMBERS COMPACT INCUBATORS Order number Model IMC18 Convection technology Mechanical convection Temperature range C Spatial temperature deviation 1 at 37 C ± 1.2 C Temperature deviation over time at 37 C ± 0.2 C Footprint m 2 / sqft 0.12 / 1.3 Chamber volume L / cuft approx. 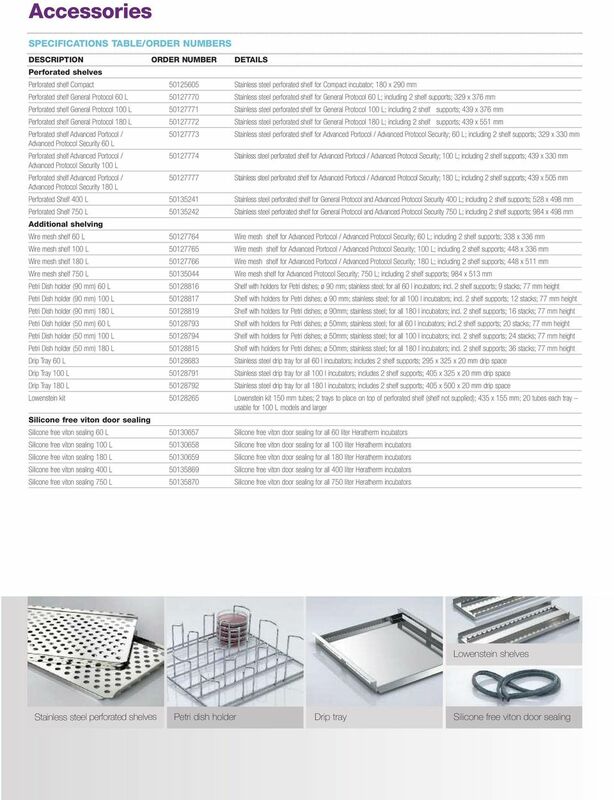 18 / 0.65 Dimensions chamber, mm / in (W x H x D) 180 x 310 x 290 / 7.1 x 12.2 x 11.4 exterior 2, mm / in (W x H x D) 260 x 415 x 470 / 10.2 x 16.3 x 18.5 Number of shelves supplied / max 2 / 3 Max. 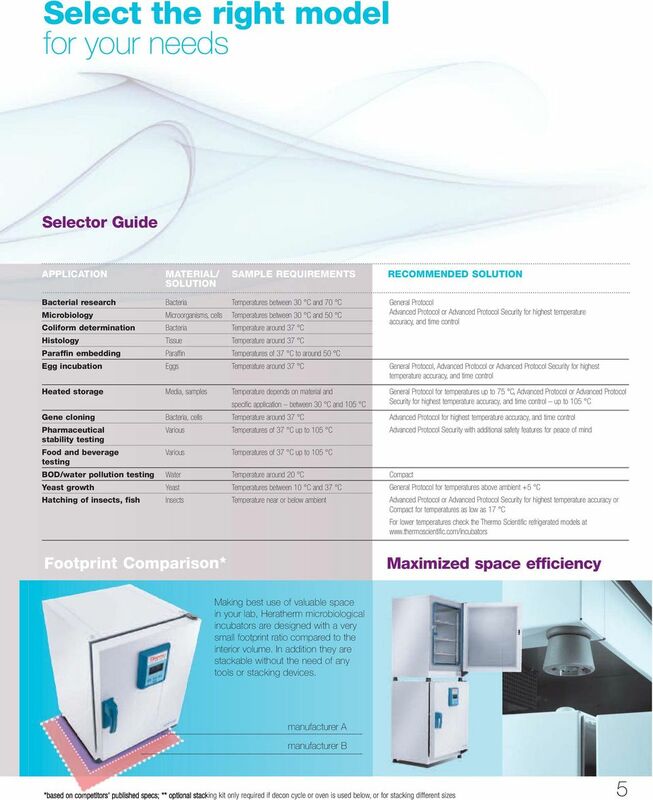 shelf load kg / lb 2 / 4.4 Rated voltage / frequency V / Hz / 50/60 Rated power / max. 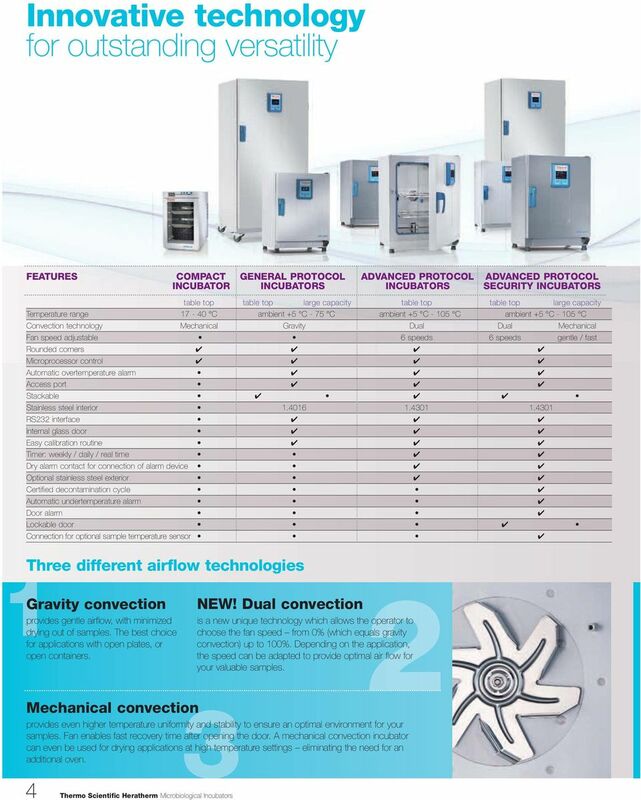 current W / A 45 / Weight kg / lb 7.2 / 15.9 Energy consumption at 37 C W 14 NOTE: All figures in all tables are typical average values for series devices, based on factory standard following norm Din Please contact us for certification information or IQ/OQ documents. 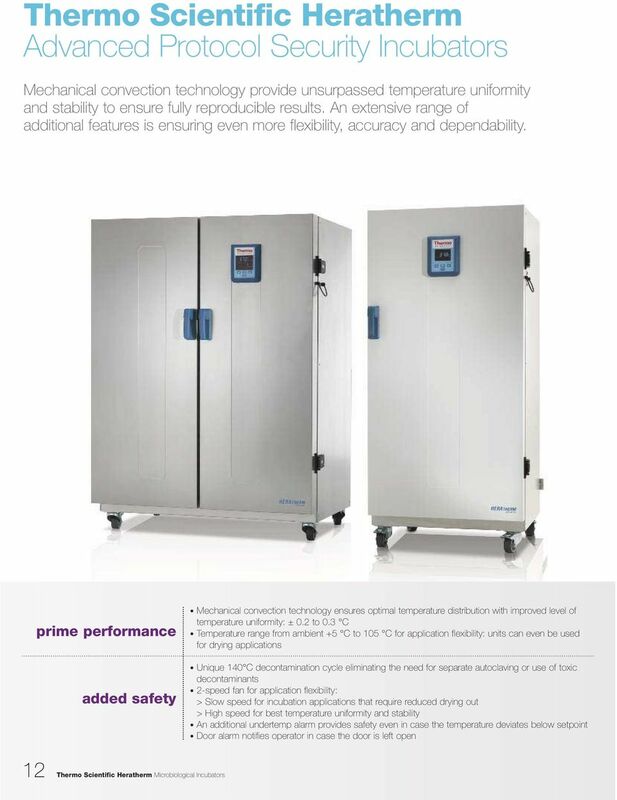 8 Advanced Protocol Incubators Exceptional temperature performance for demanding applications. 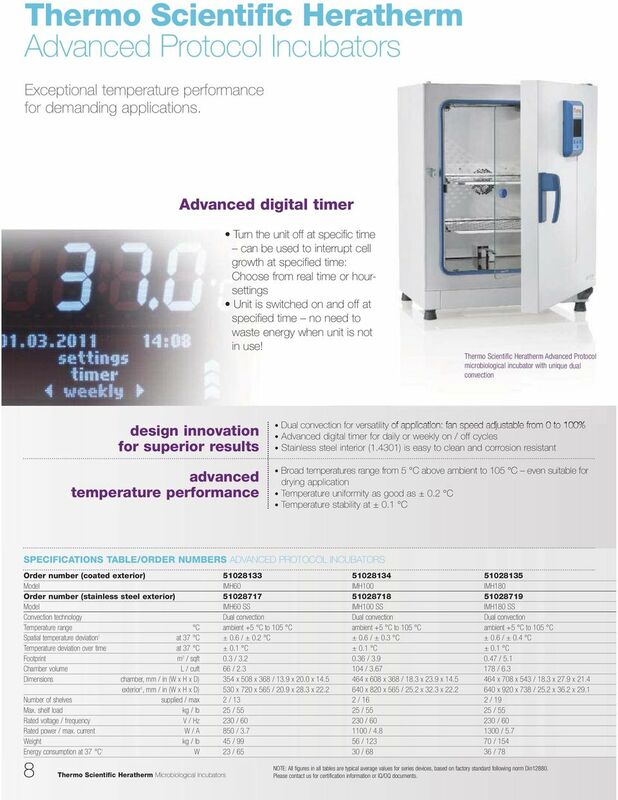 Advanced digital timer Turn the unit off at specific time can be used to interrupt cell growth at specified time: Choose from real time or hoursettings Unit is switched on and off at specified time no need to waste energy when unit is not in use! 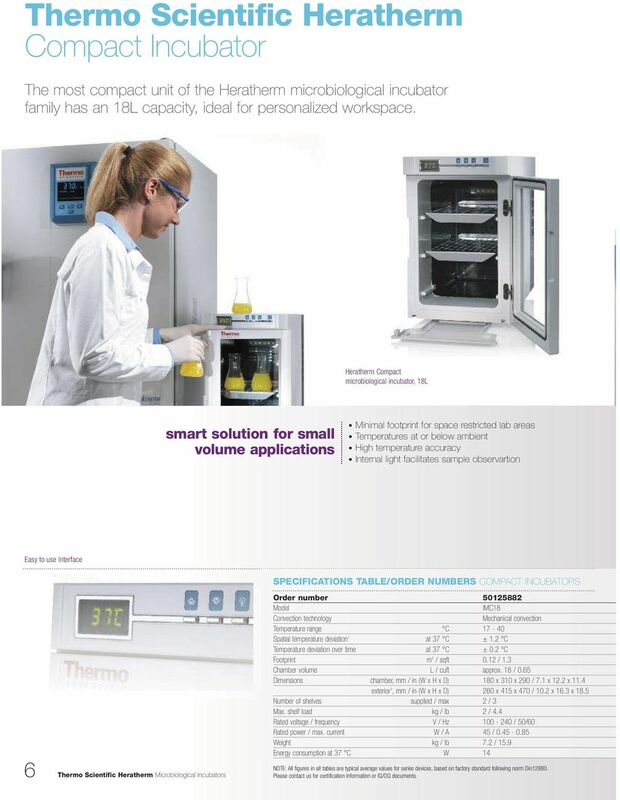 Thermo Scientific Heratherm Advanced Protocol microbiological incubator with unique dual convection design innovation for superior results advanced temperature performance Dual convection for versatility of application: fan speed adjustable from 0 to 100% Advanced digital timer for daily or weekly on / off cycles Stainless steel interior (1.4301) is easy to clean and corrosion resistant Broad temperatures range from 5 C above ambient to 105 C even suitable for drying application Temperature uniformity as good as ± 0.2 C Temperature stability at ± 0.1 C SPECIFICATIONS TABLE/ORDER NUMBERS ADVANCED PROTOCOL INCUBATORS Order number (coated exterior) Model IMH60 IMH100 IMH180 Order number (stainless steel exterior) Model IMH60 SS IMH100 SS IMH180 SS Convection technology Dual convection Dual convection Dual convection Temperature range C ambient +5 C to 105 C ambient +5 C to 105 C ambient +5 C to 105 C Spatial temperature deviation 1 at 37 C ± 0.6 / ± 0.2 C ± 0.6 / ± 0.3 C ± 0.6 / ± 0.4 C Temperature deviation over time at 37 C ± 0.1 C ± 0.1 C ± 0.1 C Footprint m 2 / sqft 0.3 / / / 5.1 Chamber volume L / cuft 66 / / / 6.3 Dimensions chamber, mm / in (W x H x D) 354 x 508 x 368 / 13.9 x 20.0 x x 608 x 368 / 18.3 x 23.9 x x 708 x 543 / 18.3 x 27.9 x 21.4 exterior 2, mm / in (W x H x D) 530 x 720 x 565 / 20.9 x 28.3 x x 820 x 565 / 25.2 x 32.3 x x 920 x 738 / 25.2 x 36.2 x 29.1 Number of shelves supplied / max 2 / 13 2 / 16 2 / 19 Max. 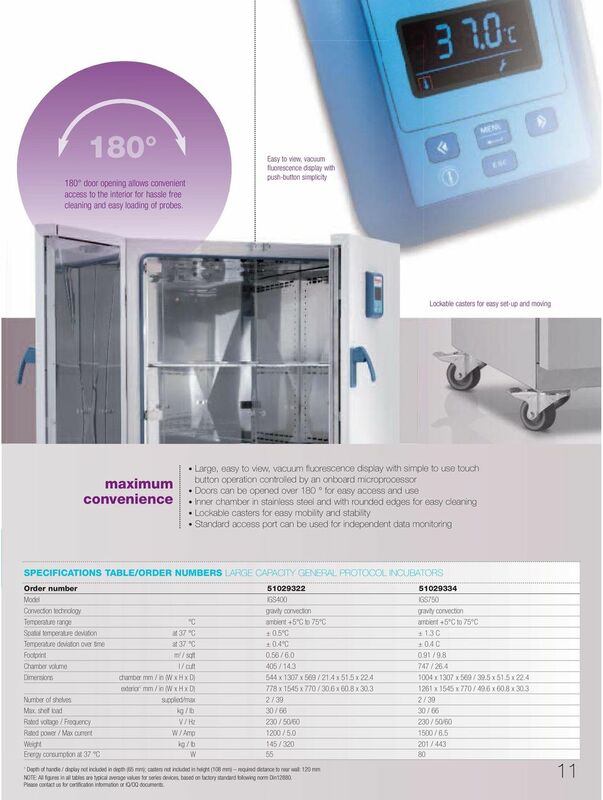 shelf load kg / lb 25 / / / 55 Rated voltage / frequency V / Hz 230 / / / 60 Rated power / max. 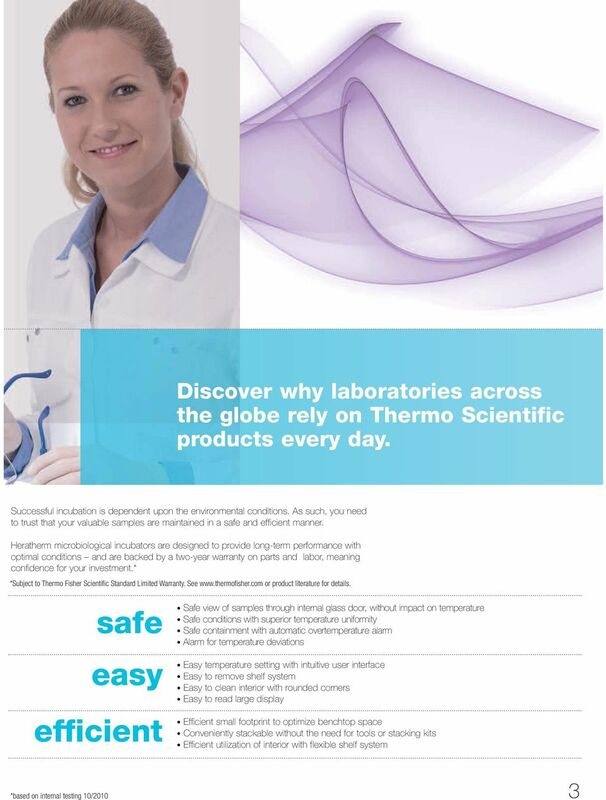 current W / A 850 / / / 5.7 Weight kg / lb 45 / / / 154 Energy consumption at 37 C 1 W 23 / / / 78 8 Thermo Scientific Heratherm Microbiological Incubators NOTE: All figures in all tables are typical average values for series devices, based on factory standard following norm Din Please contact us for certification information or IQ/OQ documents. 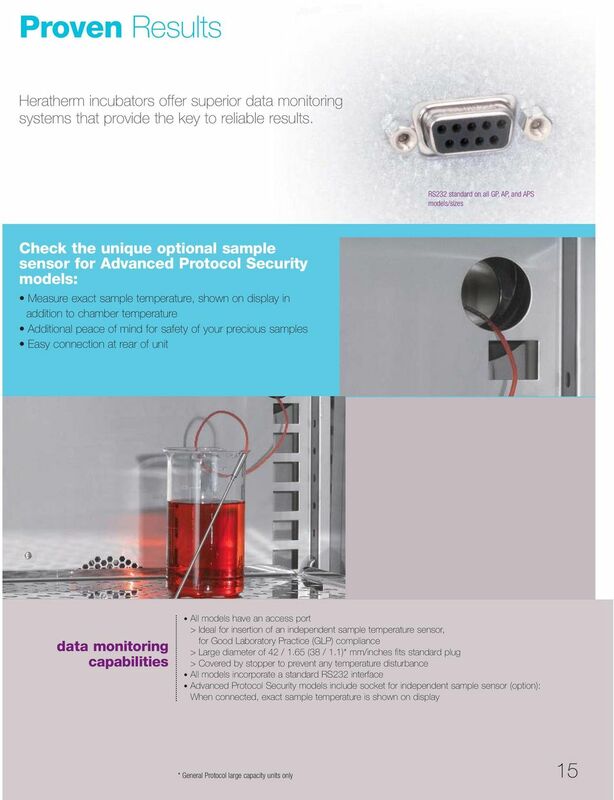 MCP 100 MCP 150 Modular Compact Polarimeters ::: Superior Optical Instruments Your Promise Anton Paar's Solution You have always made sure that your optically active substances meet all quality standards. 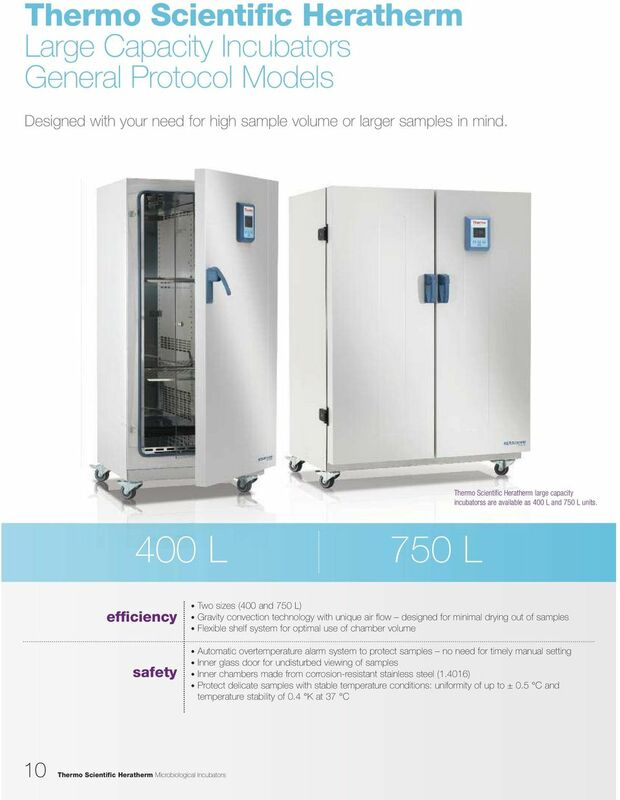 CO 2 -Incubator. 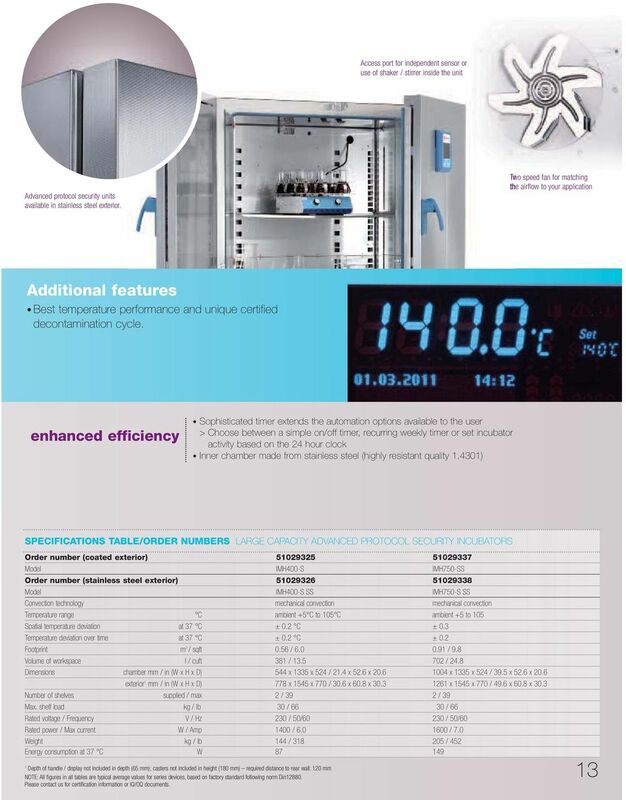 Professional Cell Culture CO 2 incubator with UV sterilisation. 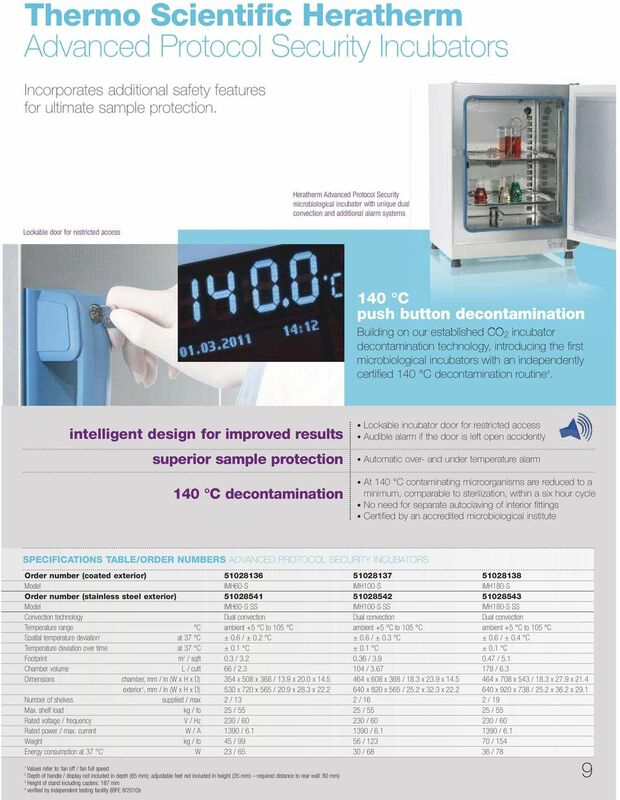 Contamination-Controlled. 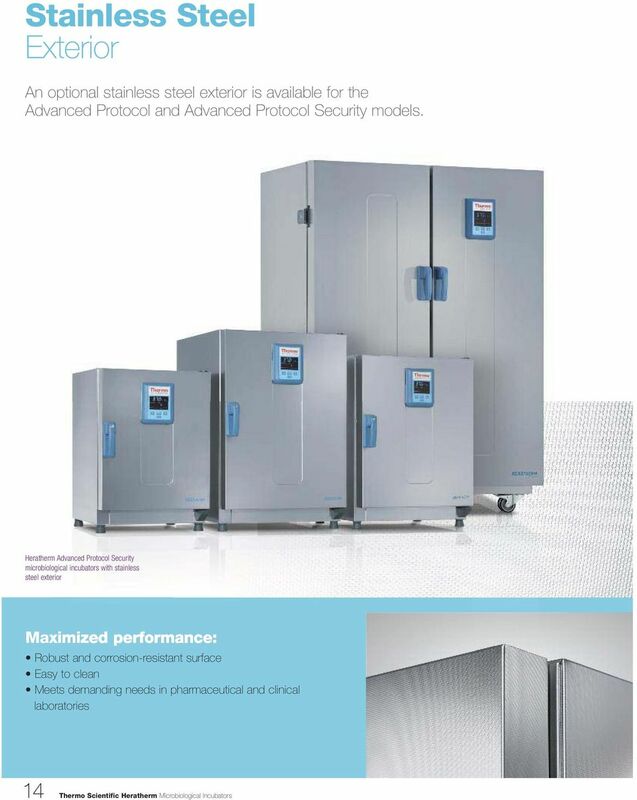 Downtime-None.